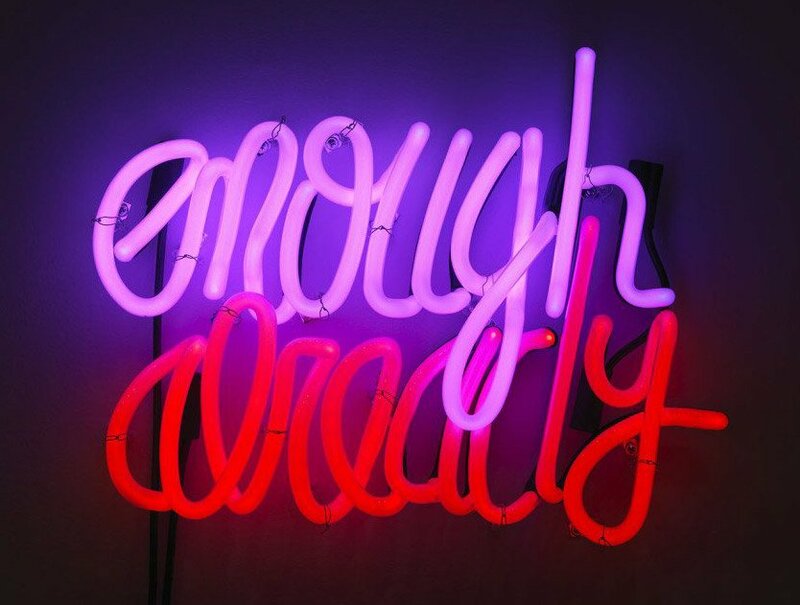 Deb Kass, Enough Already, 2012, Neon sign with transformers, 18 ½ X 14 inches. “The Personal Is Political: Feminist Art from the Sara M. and Michelle Vance Waddell Collection” is a two-site exhibition. The works are from the private collection of Sara Vance Waddell, an arts philanthropist and advertising media executive who has collected feminist-leaning art over the past decade. Wave Pool Gallery in Camp Washington and the Dorothy W. and C. Lawson Reed Jr. Gallery at the University of Cincinnati’s College of Design, Architecture, Art and Planning are hosting shows. Artists include Louise Bourgeois, Tania Bruguera, Deb Kass, Barbara Kruger, Kara Walker, Catherine Opie, Lorna Simpson, Carolee Schneeman, Kiki Smith, Mickalene Thomas and Carrie Mae Weems. More than half a dozen works by these artists, as well as some up-and-coming contemporary artists, will be on display at Wave Pool. “The Personal Is Political” aims to demonstrate the ways in which feminist artists make connections between the details of our daily lives and our expanding understanding of the body politic. Independent curator Maria Seda-Reeder has organized the shows. The Wave Pool exhibit will be open through March 11. The exhibit at Reed Gallery runs through April 2. Friday, Feb. 10, noon to 1 p.m. Wave Pool (formerly scheduled at Reed Gallery). Gallery Talk: A panel discussion among artists and the collector. Features Ohio-born, Los Angeles-based artist Andrea Bowers, Iranian-American artist Sheida Soleimani, and Cincinnati-based photographer Merrilee Luke-Ebbeler in a conversation with the curator, Maria Seda-Reeder. Free. Thursday, Feb. 16, 5 to 7 p.m. Opening reception, Reed Gallery. Saturday, Feb. 25, 6 p.m., Wave Pool. A night of poetry and performance by local artists curated by Sidney Cherie Hilley. Free.